The Musikfest, Berlin’s 20th-century music festival, took a welcome occasion to revisit the opus of Lutosławski upon his centenary this year. Following the appearances of guest ensembles such as the Royal Concertgebouw, Philharmonia Orchestra and Bavarian Radio Symphony, the Staatskapelle Berlin performed his Mi-Parti (1976) under Music Director Daniel Barenboim alongside works by Beethoven and Verdi at the Philharmonie on September 15. 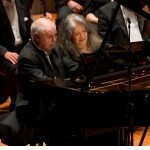 The main event, however, was the appearance of Martha Argerich as soloist. The pianist is famous for her last-minute cancellations; health problems in recent years have further diminished public performances. She seemed in high spirits, however, as she and Barenboim took the stage. It is not to any pianist that he would cede the bench, having made the Beethoven Concertos something of a signature in performances which he has conducted from the piano with both his own orchestra and the Berlin Philharmonic. Argerich’s touch can be feather-light or bold and spontaneous, much like Barenboim, but never sloppy. She created a playful atmosphere in the opening movement of Beethoven’s First Piano Concerto, in C-major, which reflects the composer’s high spirits shortly after arriving in Vienna. The orchestra responded with a hefty but elegant sound. In the following Largo, Argerich’s pianissimo was uncanny in its gentle quality that nevertheless carried to back of the hall. The strings of the Staatskapelle in fact struggled to match its beauty until the end of the movement, while solo clarinet passages were sensitively phrased. The musicians’ energy exploded in the Rondo. Barenboim revealed one of his main strengths as he leaned back and let the orchestra go, only to dig in unexpectedly to create powerful climaxes. At times he was clearly following Argerich’s lead as she swept through the galloping chords with a tremendous freedom but immaculate articulation. In the wake of thunderous applause, Barenboim had to grab her elbow and force her to bow a second time. He also coaxed her to give an encore before joining for a four-hand work by Schubert. Their rapport was evident in the easy coordination between registers and homogenous phrasing, although Barenboim seemed to enjoy the spotlight more than Argerich. Mi-Parti, one of the most important works from Lutosławski’s middle period, opened the program in a finely-wrought execution which speaks to the care Barenboim has invested in every section of the orchestra over nearly two decades. The strings created a transparent, glassy backdrop for the fragmented entrances of individual wind instruments, a tapestry which recurs in a rigorous structure emulating medieval fabric that is colored differently on either side. The coda evokes a spiritual realm, moving from a celeste and harp rhythms that are picked up by the timpani until the harp is plucked over muted but screeching strings. Verdi’s Quattro pezzi sacri (Four sacred songs), alternating devotional a-cappella with fully scored operatic drama, were more uneven in performance. The first sopranos of the Rundfunkchor Berlin sounded uncharacteristically under the weather in numbers such as Ave Maria and Laudi alle Vergine Maria, while the brass section in numbers such as Stabat Mater was slightly too Wagnerian for this listener. Nevertheless, it was impossible to resist the dramatic power of the final Te Deum as a male a-capella ensemble cedes to full chorus and orchestra, a direct expression of the personal faith Verdi managed to sublimate in his art. This entry was posted on Friday, September 20th, 2013 at 6:51 am	and is filed under Berlin Times. You can follow any responses to this entry through the RSS 2.0 feed. Both comments and pings are currently closed.